For the last little while i have been doing healthy and kid-friendly recipes, now it is time to vary things a little bit with some art – a study of a subject. In the past, I have done studies of one subject in the same medium. 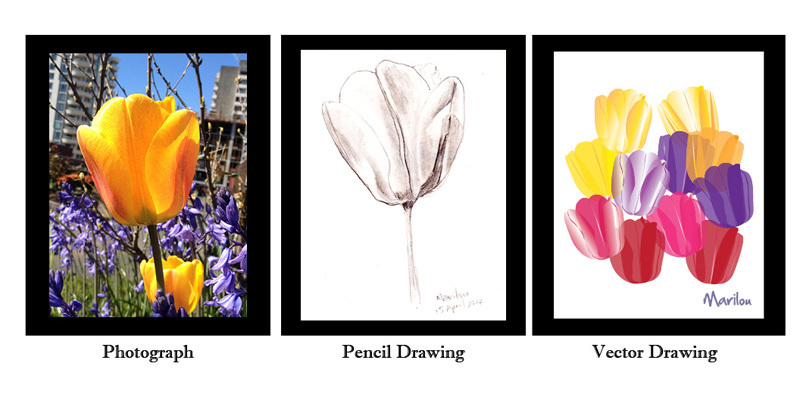 This time I did one subject, tulips, in 3 very different mediums – a photograph, a pencil drawing and a vector drawing. This just happened spontaneously and in retrospect, I believe it would be good to do this more often. Take pictures. Start with a close up view of your subject and take pictures. – whatever camera you have will do. Take the time to compose it and in different angles. Sketch. I carry a small sketch book with me and use it when there’s opportunity to do even a quick sketch using a printed photograph or straight from a phone camera. I find that sketching by hand really helps in understanding the shapes, proportion and subtle colour shifts and gradients. Do more than one if you can. Create a vector art without looking at your reference material (photograph or sketch). Use the reference material only after you’ve tried digital drawing from memory. You’ll be amazed how much you can remember of the subject. Fine tune. Now you can refers to the reference materials and make changes to your vector art. Compare all your art work, just as I did here side by side. Try it! You’ll get to understand more about your choice subject and as I found it, the approach I took in creating each art improved. I’m excited to start blogging on WordPress. For now I decided to include my art blog posts to my main blog. Step 1: Select your pumpkin. Once you’ve picked up your pumpkin, keep it in a cool dry place until you are ready to carve it. 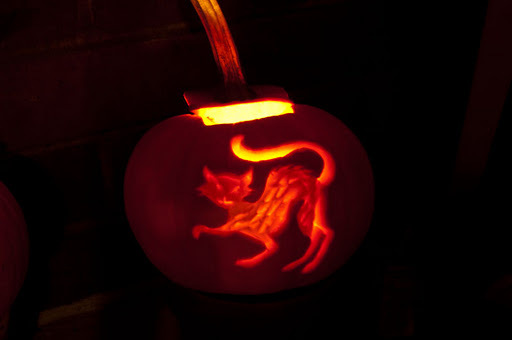 A carved pumpkin can only last a few days especially if you have lit a candle inside it. 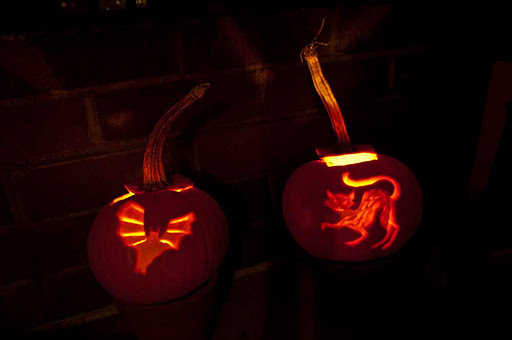 Tip: Select your pumpkin with a design in mind. 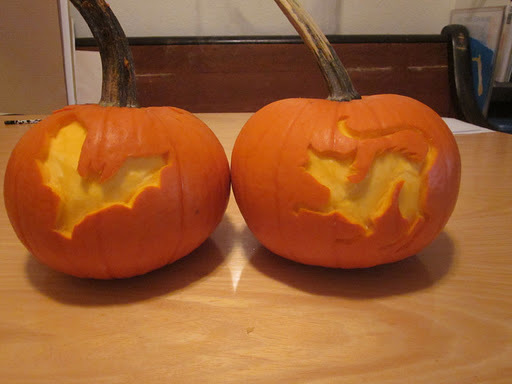 Use the natural shape of the pumpkin and stem and incorporate into your design. Step 2: Select a simple design. There are many sites online for free printable designs. Scale it to size to maximize the size of the design to make it easier to carve. Smaller designs are more challenging. Print it on paper. Step 3: Use pins to keep your paper in place. 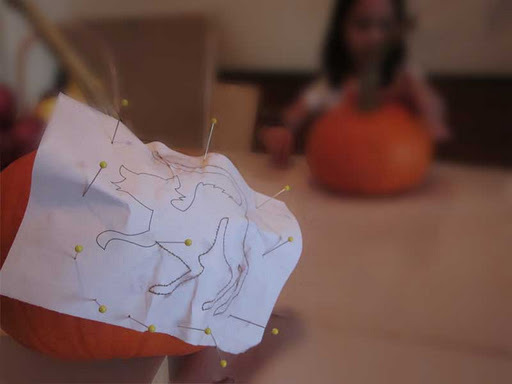 Tip: Adjust the paper by making mini-folds (instead of bigger folds) to accommodate the curved surface of the pumpkin. Start pinning! 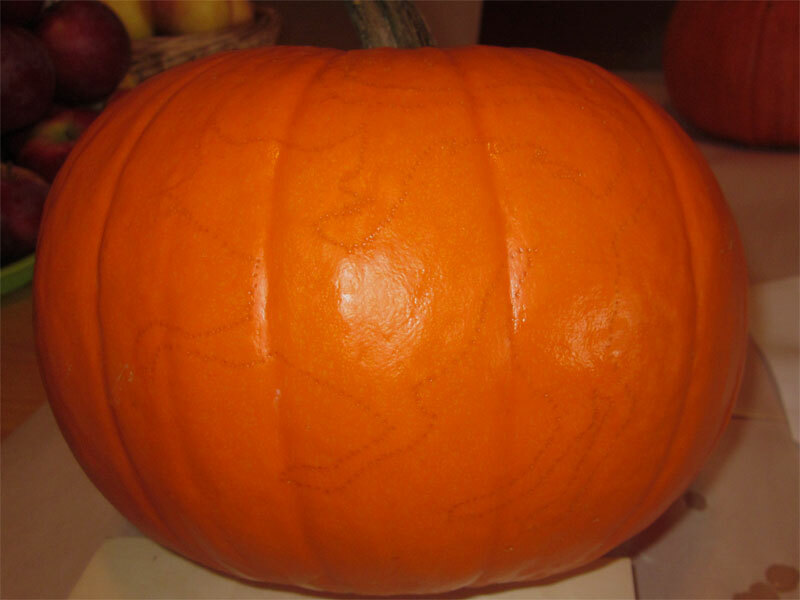 Basically you use a pin to trace the design from the paper and transfer it on to the pumpkin. Step 4: Start carving using the pinned design. You’ll end up with something like this. Can you see the design? Tip: You can trace the design again using a pencil to make it easier to see. Tip: I trace the entire outline first using an Exacto knife for more precise carving. Step 5: Continue carving until you have carved out the design. Tip: Use different size and tips of knife to make it easier to carve certain areas. Tip: Using different thickness of the pumpkin flesh will determine how much light comes through. Tip: Cut through some parts of the design to let more light through and allow air. Tip: When lighting using a candle, use a tealight holder to keep the candle secure. Tip: Keep the lid a little open to allow air for the candle to continue burning. 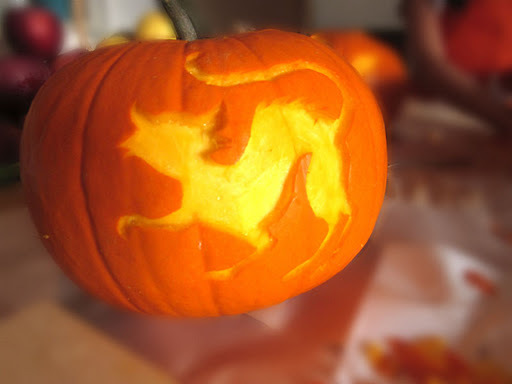 Do not leave your lit pumpkin unattended! Extra!! Wash and roast the pumpkin seeds and sprinkle with salt in a 350 degree oven until light brown! My gingerbread roof in a collection! It was a nice surprise to be included in a curated collection at Artfire. Mine is the gingerbread roof photo on a magnetic bookmark for $2.50. Middle column on the third row. Come check it out and look around for some great stocking stuffers!